I originally wanted to blog about my Taiwan trip, but unfortunately Flickr is down, and since I’ve already uploaded photos for this noodle dish, I shall blog about it instead! Sweet potato noodles are, as its name suggests, made with sweet potato starch. It is different from the transparent cellophane noodles (冬粉) which are made with mung bean starch. Personally I felt that both have roughly the same texture and both being tasteless on their own, they absorb flavours very well. Sweet potato noodles are often used in a very popular Korean dish called japchae – it is made by stir-frying sweet potato noodles with various vegetables and meat and flavoured with sesame oil, soy sauce and sugar. Just talking about it is making me drool already! I found this japchae recipe from an iPhone magazine application – the Kfood Magazine app. Though the app features only about 5 Korean dishes, each dish came with step-by-step videos (yes videos, not photos!) which is a major plus point for those new to Korean cuisine! There are a lot of step-by-step photos this time round so I’ve reduced the image to an even smaller size so that the post won’t be so lengthy. 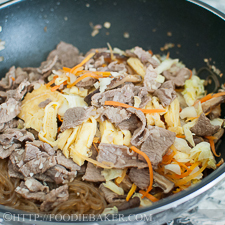 Let’s make some japchae now! 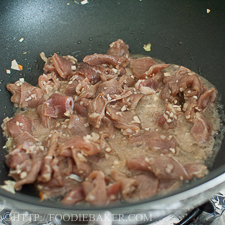 1) Combine beef slices, minced garlic and diced onion together. 3) And some soy sauce. 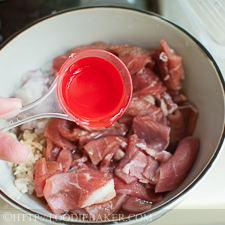 4) A little vinegar to help tenderize the meat. 5) And a little of my favourite seasoning – sesame oil. 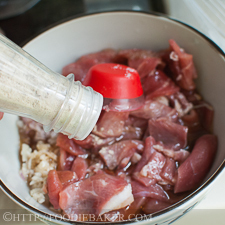 The marinade gives the beef slices a very wonderful flavour. The marinade may seem watery and a lot, but don’t worry, as the rest will be absorbed by the noodles later on, giving the noodles a very deep and delicious taste. 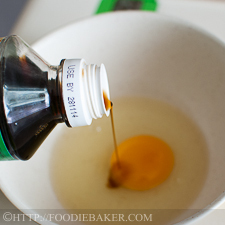 1) Crack an egg and season with some light soy sauce. 2) Fry the egg into an omelette. 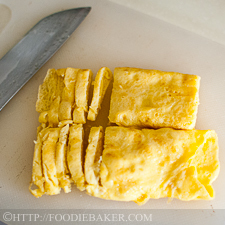 3) Roll and slice the egg into thin strips. 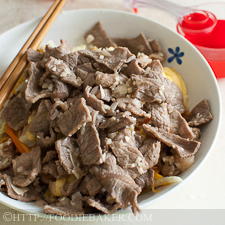 I love adding eggs in my noodle dishes – be it in noodle soup or in fried noodles. My favourite way was to fry, roll and slice thinly, but you can scramble the eggs if you don’t want to go through all these trouble – whichever way works for you! 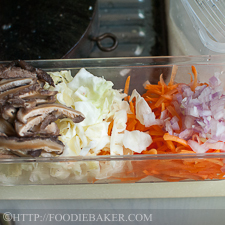 1) Prepare the vegetables – shiitake mushrooms, cabbage, carrot, onion. 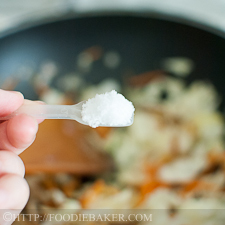 2) Stir-fry the onion and carrot until soften. 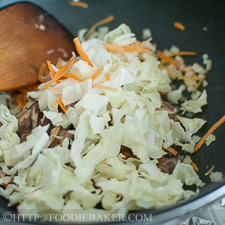 3) Add in cabbage – I don’t like to cook the cabbage for too long as I want to retain the crunch. 4) Season the vegetables with a little salt. 5) Transfer the vegetables out in a plate. 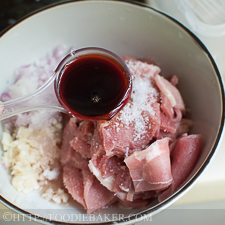 6) Add in the beef – marinade and all – they’ll take only seconds to cook! 7) Remove the beef the moment it is cooked! 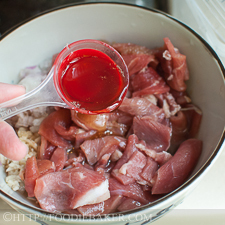 8) Bring the marinade to a boil. 9) Add in the softened sweet potato noodles. 10) Season with both light and dark soy sauce. 11) The noodles are absorbing the marinade and seasoning! 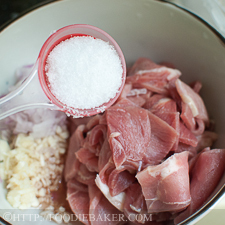 12) Add in all the other ingredients and toss. Hope you will like this dish as much as I do! Noodles: Boil a pot of water. Soak the noodles in the hot water for 20 to 30 minutes until softened. Drain the noodles and rinse under cold water until cool. Set aside to drain. Beef: Rinse and drain the beef slices if needed to get rid of the blood. Combine all the beef ingredients together and set aside, covered, and marinate for 15 minutes. Eggs: Beat the eggs in a bowl and add in the soy sauce. Beat to combine. Heat a frying pan with a little oil over medium-high heat and add in the beaten eggs. 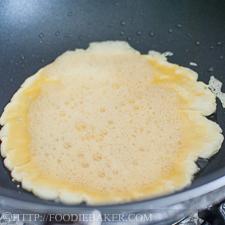 Tilt the frying pan so the uncooked eggs flow all around to form an omelette. Lower the heat down to medium and when the egg is almost cooked, roll it up and transfer onto a chopping board. Let the omelette cool slightly before cutting into thin slices. Set aside. Vegetables: Heat a little oil in a frying pan. 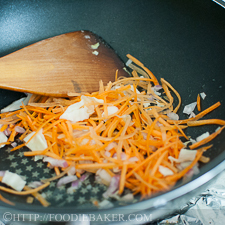 Add in the onion and the carrot and stir-fry over medium heat until the onion is translucent and the carrot has softened. Add in the shiitake mushrooms and cabbage and stir-fry until the cabbage has reduced in size slightly but still retains its crunch. Season with a little salt and transfer onto a plate. Set aside. Back to the beef: Heat a little more oil in the same frying pan. Turn the heat up to high and heat the oil until it is really hot. 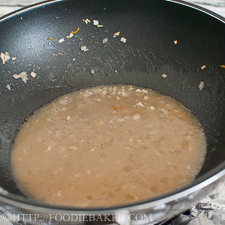 Turn the heat down to medium and add in the beef all at one go, stirring and tossing vigorously. Once the beef is no longer pink, turn the heat down to low and remove them immediately from the frying pan and onto a plate. The beef cooks really fast, so watch the beef! 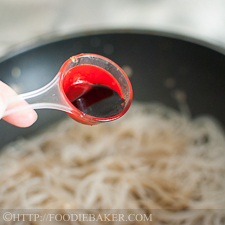 Back to the noodles: There should be some meat marinade left in the frying pan. Turn the heat back up to high and bring the marinade back to a boil. Turn the heat down to medium and add in the noodles (which will gladly absorb the yummy flavours). Add in the noodles seasoning and a little bit of water if needed. Taste the noodles and season accordingly to suit your taste. Add in the eggs, vegetables and beef and toss until everything is combined. Test the seasoning again before serving. Serving: Serve hot or cold. You can garnish it with some sesame seeds or coriander leaves before serving. This may seemed like a really long list of ingredients, but some of them are repeated (like seasonings) and most of them are already found in your pantry so you don’t have to go and get them again (if not, most of them can be found in Asian grocery stores). The preparation time may take a while – soaking the noodles, marinating the beef, cutting up the vegetables – but the actual cooking takes very little time! I would advise to have everything ready – have all the ingredients chopped and ready and seasonings not far from you before you start to cook, so that you won’t get flustered so easily! Shiitake mushrooms: Dried shiitake mushrooms pack a lot of flavour and taste – soak the dried ones in hot water for 45 minutes to 1 hour so that they turned soft. If you’re in a rush, simmer the mushrooms in a small pot of water for 20 to 30 minutes until they are soft. Noodles: If you don’t have sweet potato noodles, substitute with rice vermicelli or glass noodles. 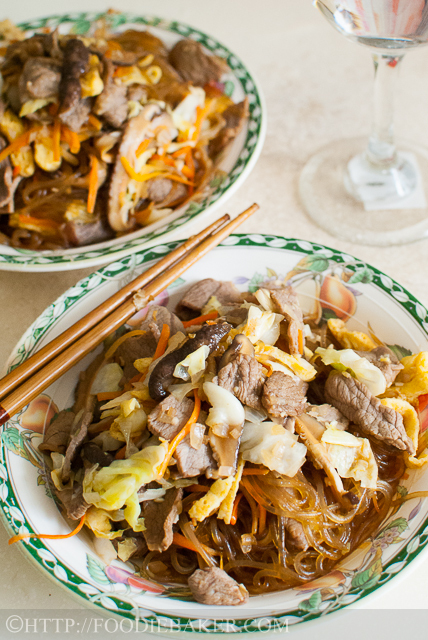 After stir-frying the beef and removing them from the pan, remove 1/2 of the marinade left in the pan (as rice vermicelli and glass noodles are not as absorbent as sweet potato noodles) before adding in the noodles. Thank you for the additional information regarding the water temperature. I’ve run into the issue before of ‘soaking’ noodles for various times depending on the temperature of the water. The first time I made pad thai, I ‘oversoaked’ the noodles so that they were practically mush by the time I had added the raw eggs, bean sprouts, cooked chicken etc. This looks delicious! I have eaten this noodles at Korean restaurant, never tried cooking it at home before. Yours look absolutely delicious! Hi Jasline! I LOVE japchae!! Sure there are a lot of steps involved but they’re quite simple and easy, no? Thank you so much for featuring my recipe on your lovely blog as it led me to you! I love meeting and making new friends in this blogging community 😉 I look forward to following your foodie adventure! Your recipe sounds terrific. I know I won’t be able to find sweet potato noodles in my area but you mentioned that the texture and taste was similar to cellophane noodles which I can find at my market. Nicely detailed post. Thank yuo John! 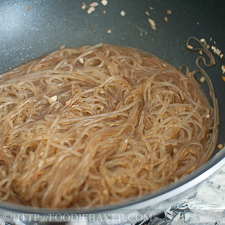 If you can’t find sweet potato noodles, you can substitute it with glass/cellophane noodles. They are thinner but very similar to sweet potato noodles 🙂 Glad you like the recipe! Thank you! I love eating it and I’m so happy to replicate it in my house, so now I can eat it whenever I want to! Thank you! Sweet potato noodles should be available in Korean or Asian markets, if not, you can use rice vermicelli or glass noodles. 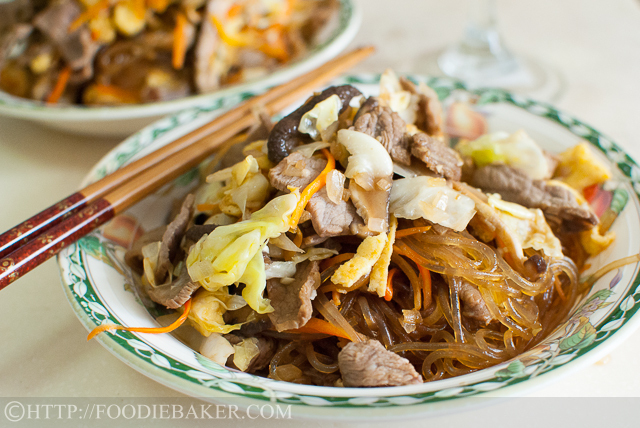 I think glass noodles will be a very close replicate of this recipe! Hi, Jasline, thanks for visiting my blog earlier. I haven’t made japchae for a long time! Yours look really good there! 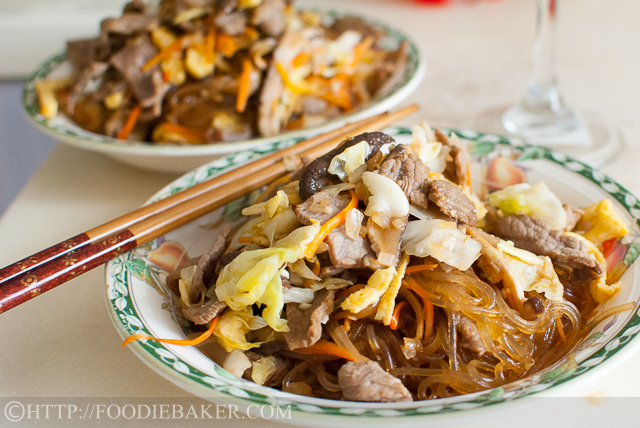 This looks mouth-watering Jasline, I love sweet potato noodles and much more with that beef! 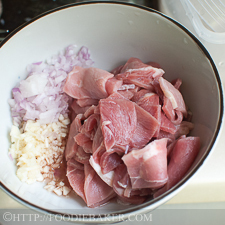 What a great dish, Jasline, and your post laid out its preparation quite clearly. I’ve not seen sweet potato noodles but will look for them now.I’m really anxious to learn their taste. I’ve pinned this recipe so I can find it once I find the noodles. Thanks, Jasline. This noodle dish looks delicious! Absolutely delicious and one of my favourite noodle dishes hands down. Never made these before but you’ve inspired me to try my hand at Japchae! This sounds amazing! I’m drooling with you. 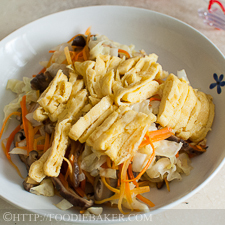 Fantastic recipe, I have never seen sweet potato noodles before. If I can’t find them can I use another kind? There do seem to be a lot of steps involved but I’m guessing it takes longer to read them than to actually DO them. 🙂 I’m curious as to the definition of ‘hot’ water that’s used in many recipes. Do you mean hot water out of the tap, as in as hot as it gets, which isn’t very hot in some places, or water which has been brought to the boil? 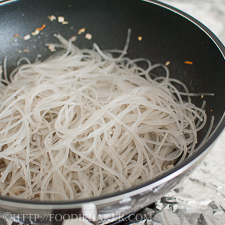 I’ll have to keep an eye open for sweet potato noodles but if I can’t find any, I wonder if using thin/vermicelli rice noodles would work, or even the glass/cellophane noodles made with mung beans.